Teaching a child the value of giving is a noble cause that has gotten a lot of interest. There are loads of great resources on the Internet about how giving builds connections, relationships and feels great! So, you are hooked. I want to teach my kid about giving. How? Learning how to give things, your attention, time and honest feedback is a lifelong skill. Before you have a conversation with your child, reach inside and ask, “Am I caring for myself while preparing for the holiday?” If you are, congratulations! If you are not, remember this lack of self-care is also something your child is learning. Before you ask, “Why would you teach a child to say ‘No. Thank you’?” Ask yourself: Is it a skill I have? Is it a skill I am using? Mindful eating talks a lot about savoring the bite, the taste. It talks about permission to eat, but it is often forgotten in the conversation that everyone needs permission to say “No. Thank you.” To food, and to other things, activities and situations. The grammar nerds that are reading have noticed the punctuation choice of a period after “No.” This means that there is more than a quick pause. “No,” as written, is a firm declination of the offer. The “Thank you” is a separate thought, offered to acknowledge the kindness behind the offer. Now lets up the ante and look at a few examples of how to send a clear intention to decline food. You are in the break room, and someone brought in donuts. The box has been left open, so they are hard and stale. Go ahead, say “No. Thank you.” That was easy because you are not hungry, and the food choice wasn’t very tasty. You can use this skill with your child as well. If the food offered is unappealing, go ahead and practice saying “No. Thank you.” Celebrate the ability to say no, so it feels like a reward instead of deprivation. Start on the easy foods and slowly work up to more challenging situations like the ones below. You are picking up friends at their house after work. You are not hungry, but the moment you step into the kitchen you notice the plate of brownies and temptation sets in. You want the brownies (which is normal), but you also know there will be more food at the party, and you are not physically hungry. Can you say “No. Thank you”? If you can’t, add the step of empathy. Try this: “Your brownies look wonderful! I am going to resist them because I am not hungry, and there will be loads of food at the party.” You can use this skill of adding empathy about food temptation with your child as well. “Oh, you are right. They look good!” You can ask, “Are you able to resist?” Coach the child because he/she may not realize that more choices will be available. You can also set an expectation that he/she will eat at the party. You can even see if you can save the brownie for the party. Now for the hardest situation. You notice that you are hungry, tired and a little bit frazzled by the day. You find yourself in a food oasis, surrounded by all your favorite chips and desserts, and you can smell peppermint hot chocolate. Your head begins to swirl in a delusional food fantasy. What to do? Here is when using your ability to say no softens. You are going to make a food choice because of the delight it will bring. The key is choice because you know you can’t eat it all. It is hard to make a choice in these situations, so again, begin with self-empathy. “Man, I am so tired and frazzled by the day, it is hard to make a choice.” Now focus on what you would enjoy most. Ask, “What would make me feel the best right now?” Connect with your largest need and then make a plan to meet that need. You can use this skill with your child as well. Empathy first, then begin to advocate self-care when dealing with a very tempting situation. “John, look at this amount of crazy food! Let me help you make a choice.” Scan the situation with your child. Explain, “Let’s look at everything. Come with me and we will walk around and see what is available.” If he sees more than one food that he has to have, comfort him because mindful eating is about choosing between two wonderful things. It isn’t about restriction or deprivation, such as suggesting to a child to choose applesauce instead of apple pie. The intention is to enjoy food, and that includes enjoying a dessert. This month, Mindful Eating for Kids is exploring the idea of teaching kids to give. Parents understand that talking about giving, and how to give, is a complex topic. It involves conversations about giving that require you to examine how you give your time, attention and control in the holiday planning. Talk to your kids not just about what to give but also how to give. Questions help your child learn what makes giving special or yucky to him/her. It takes courage, as a parent, to not sweep the yucky gifting experience under the table. It takes courage to listen to your child express the associated feelings and frustrations of how a gift-giving flop triggers fears of “He doesn’t like me.” It takes patience to keep learning how your child feels about giving different types of items during the holidays. In the Explore phase of change, you and the child are learning about likes, dislikes, wants and needs in an endless conversation that is fueled by curiosity instead of fear, avoidance and wishful thinking. A lot of people, myself included, struggle with giving because of the unspoken expectations that can be associated with the holiday. Is this true for your child? Getting and giving what everyone else is receiving feels safe but can leave a person feeling empty. Talk with your child to learn if this is part of a larger desire. Resist questions such as, “Michael, what do you want to give your coach, Mr. Dyson?” because you will likely hear “I don’t know” or the usual safe “gift card” response. Helping your child connect to what he likes about Mr. Dyson will be more effective. “Michael, tell me three things you like about Mr. Dyson.” “What are three things Mr. Dyson values?” If your child can’t come up with any likes or values for the recipient, decide if you are comfortable turning the conversation to what are the expectations and desires surrounding giving. Guide children to reexamine the desire to give: Is it to fit in, influence, or something else? For giving to not feel hollow, it has to come from a place of open-handed generosity. Explore with a child what would feel comfortable to him/her. Would a holiday card feel welcome and valued? Many children are not aware that a card with a heartfelt message, poem or picture is a valuable expression of time and effort. If you are giving food, ask your child if every gift has to be dessert. Begin this conversation with questions about the values and beliefs of the people receiving the gift. Does Ms. Ways enjoy eating healthy? What are other things to try instead of cookies? Would she enjoy soup, spice mix, hot cocoa mix, or a casserole instead? Does she have a dog? Could we make cookies for her pets, or create a bird tree, or even donate food to a local animal shelter in her name? When a gift reflects the shared connection between two people, the connection is strengthened. This process of connecting is also happening between you and your child while you explore, plan, gather and create. When the process of giving fills a need, eases pain, or soothes a hurt, the gift bears witness to a larger awareness between giver and recipient, making the friendship stronger. The gesture becomes what’s valued, not the thing. Looking for other resources and ideas? I am a huge fan of the magazine Chop Chop, and in the tradition of the holiday there is a whole issue about edible gift ideas for kids to make. Looking for some simple and fun gift ideas? Wellness momma.com offers these yummy combinations with a few money-saving tips (got to love those)! http://wellnessmama.com/4430/homemade-spice-blends/ You can follow her spice board on Pinterest, too! Mindful eating is not a rigid way of feeding a child. Mindful eating is a flexible approach to food and eating at the heart of which is kindness. Mindful Eating for Kids is more than just a book of handouts. It is a new way of thinking about mealtimes that is divided into four key sections. Discover – Create the desire to try new foods and have new experiences and adventures with food and eating. 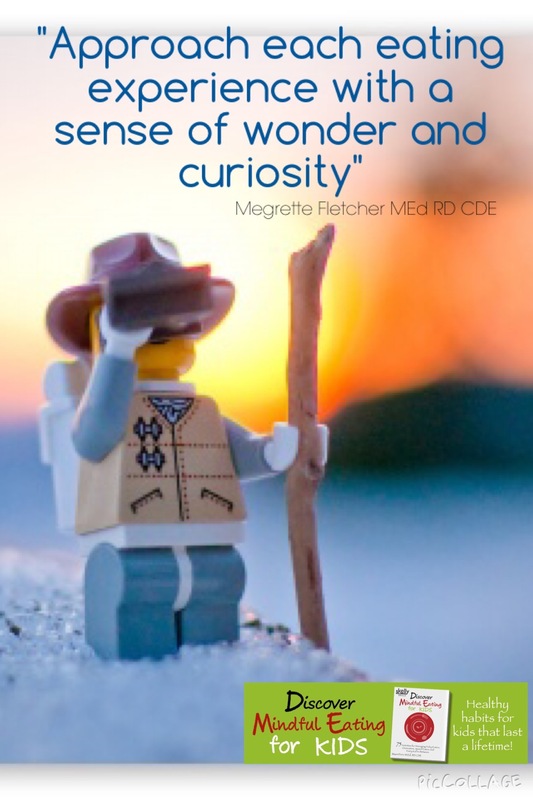 Explore – Approach each experience with a sense of wonder and curiosity. Play – Have fun! Being loud and silly and making a mess can bring enjoyment back to food and eating. Challenge – the norm of eating. Find and gently explore the boundaries of food, eating and nutrition with the child. Here is a story to prove just how much mindful eating can change mealtimes by focusing on play! When Walter was 15 years old, he was diagnosed with schizophrenia. Many people with schizophrenia are of normal intelligence but struggle to make emotional and social connections with people. This explains Walter’s behavior perfectly. Walter relates better to things than people. His behavior at meals is often so focused on eating that there is little awareness of people, social graces or his surroundings. His eating cannot be described as mindless because he is so engaged in the sensory flavor of the bite. However, his behavior is not mindful because he is unaware of the other people at the table. “It is like we don’t exist,” explains his father. In short, Walter acts like a disinterested teenager at the dinner table. On a whim, the family decided to play a game while eating dinner. The father explained: “Walter’s stepsister is in theater, and she suggested playing a game called Encore.” The game is simple, requiring one person to think of a word – for example, boat. The other players have to sing a song with the word “boat” in it. In this case, Row, Row, Row Your Boat could be sung. The next person has to think of a new song with the word “boat” in it. Mindful eating is more than having your children taste their food. Mindful eating is about creating connections and enjoying the meal. Shifting the focus to include fun, laughter and connection adds so much more than flavor to a meal. When asked to describe the meal, everyone agreed: It was more delicious and nourishing because Walter participated in the mealtime conversation. Mindful Eating for Kids offers 75 activities with a wide variety of strategies such as touching, cooking and playing with food. These carefully designed exercises use all the child’s senses to explore new foods. They help you create opportunities for the child to choose foods that are both satisfying and nourishing. You’ll have everything you need to help kids make new connections and develop a healthy, mindful relationship with food. Step one: Read the principles of mindful eating and highlight the words that resonated with you. Step two: Think for a moment, if you want these same outcomes for your child. If you do, how are you going to teach him or her any of these concepts? How do you teach a child, “That there is no right or wrong?” or “Attention” or “To respect his own inner wisdom?” This question may generate some doubt within you. You may experience frustration or even anger as a result of being asked. If thoughts rushed in your head like, “This is stupid – I just won’t serve any junk food!” or “I don’t know how to answer these questions!” it is okay. Few parents have ever thought about how many different directions they could explore to teach a child about food and eating. Of course it can be overwhelming, it’s a big job. Step four: Recognize your own childhood food messages. My childhood eating culture centered on, not wasting food. I was told to “Clean your plate.” I have to work very hard to stop these old food rules from my childhood from becoming my kid’s food rules. I really want to create a different relationship with food than the one I had. I try to honor my child’s sense of fullness and respect when my kid’s have had enough. This can be easier for some children than others. One of my kids is very respectful of her fullness. My other child is more detached from her direct experiences, which is challenging at times. Instead of having lots of food rules, I try to relax and focus on my food culture. On seeing the big picture with food and eating. How might this work? For one of my kids, I try to coach her to “Choose an amount of food that does not overfill your stomach.” Over the last decade she has shared with me some of her own food struggles and I try to use these conversations and her own observations to help guide her food and eating choices. My other child is very good at recognizing fullness, so good that there is a point that it becomes challenging for her to eat an adequate amount of nutrition or to try new foods. I have to coach her in a different way. For this child, we talk about the importance of eating (not just having on the plate) the high nutrient density foods provided. When she was younger, I would ask her – “What food did you select that has the most nutrition?” Overtime she did learn that it was not the dinner roll. The culture is to provide nutrient dense foods at each meal. Our culture is to encourage everyone to eat these foods, and choose a diet that is balanced and supports health and well-being. Step five: Repeat this view of food, eating and nutrition often until it becomes the culture surrounding the meal. Remember that it is normal for your philosophy about food and eating to evolve as the child enters different developmental stages. Keep asking questions instead of telling yourself your kids must eat a specific food or follow a rigid program. Questions open the mind up to new possibilities and promote flexibility and choice. Mindful Eating for Kids offers a simplified approach to teach nutrition that may be helpful to review. This approach can provide a basic framework to explore nutrition.